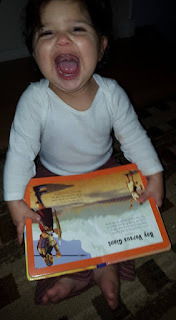 The small, puffy board book, Adventure Bible for Little Ones by Catherine DeVries, illustrated by Jim Madsen is a perfect way to introduce your baby or toddler to the bible. This thick padded board book contains a few of the most popular bible stories accompanied by bold and colorful illustrations. The word "Bible" in the title may be misleading and should be replaced with "Bible Stories". This might be confusing for some parents as this book contains short bible stories and in no way resembles a bible. This book contains some of the art from a previously published "Adventure Bible Storybook" which more resembles a "bible" than this new book. If you already own the "Adventure Bible Storybook", you may notice that this padded book is appropriate for babies who may be rough with regular books. 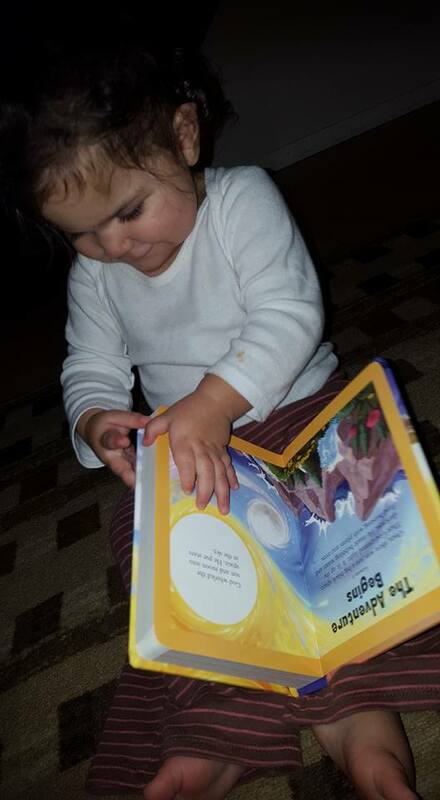 Cassidy is sixteen months old and recognized the familiar face of Jesus as well as the animals in the ark. She was excited when I gave her this book. The small sturdy pages were easy to turn on her own. This sturdy board book with its reinforced binding and heavy weight pages will stand up to wear and tear. My baby has a way of tearing through flimsy board books, but I feel this book is sturdy enough to withstand her mouth and hands. As a blogger for Booklook I received a copy of this book published by Zonderkidz for the purpose of writing this review.